You can practice nervous system vocabulary with the online crossword below. All the words in the puzzle are included in the introduction. (The purpose of this overview is to demonstrate the vocabulary in context.) So if you need more than the crossword clues to guess a word, look through the introduction to find it. (If you would prefer to download a pdf crossword, right-click here. (The answers are here.) It’s a different puzzle using the same words and clues. Click here to go directly to the online crossword puzzle. Then motor (or locomotor) neurons carry messages from the brain back to the different parts of the body, telling the hand or foot to move, etc. Neurons are very unusual cells designed for carrying electrical impulses for long distances through the body. Most neurons have a long, thin extension called an axon that reaches far beyond the cell’s nucleus. Many axons are protected by a fatty covering called myelin. Neurons also have dendrites, like little branches off the nucleus or axon, that come very close to the dendrites of other neurons. 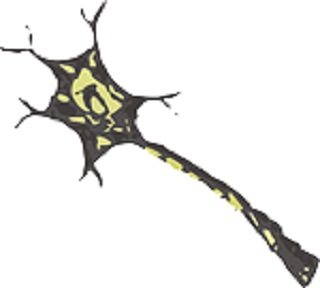 The neurons use chemicals called neurotransmitters to send messages across the synapses-- the tiny gaps (spaces) that connect one neuron with another and enable it to pass on a message. These neural signals (electrical or chemical messages) direct our movements. A sudden abnormal surge of electrical activity can cause a seizure with muscle convulsions. Irregular electrical activity can also cause tremors or twitching (jerky small muscle contractions). A deficit or excess of any of the neurotransmitters can also cause serious problems. Doctors have several ways of testing the nervous system. They may ask people to move a certain way or to report whether they can feel sensations like heat, cold, pain or skin contact in a certain area of the body. Doctors may tap a knee or foot at an exact place to check for reflexes—involuntary muscle contractions that show that the nerves in that area can respond to stimulation. (Involuntary here means ‘not under a person’s conscious control.’) Reflexes are useful when the body needs to act instantly, without thought. For example, if you touch a hot stove your hand should immediately jerk away—a reflex action that could protect you from a serious burn. If the spinal cord is cut, crushed, or otherwise injured, some or all of the electrical messages may be blocked—unable to reach their destination and tell that part of the body to move. This can result in partial or complete paralysis. One of the great discoveries of modern neuroscience is that nerves can regenerate—under certain conditions. Earlier scientists had believed they could not, because repair is much slower than in other body tissues like the skin. Problems can also originate in the brain. For example, in a cerebrovascular accident (also called a CVA or stroke), the blood supply to part of the brain is suddenly blocked (either by an embolism in a blood vessel or by hemorrhage.) Depending on the area of the brain which is damaged, stroke victims may lose part of their ability to move either their right or left side, or their speech may be affected. Neurological diseases include cerebral palsy, multiple sclerosis, muscular dystrophy, Alzheimer’s and other dementias, Parkinson’s disease, and many other less common conditions. Home> Vocabulary Games> Nervous System Vocabulary: an Online Crossword.